The author of numerous, award-winning science fiction novels with a literary and ecological bent, especially his Mars trilogy, Kim Stanely Robinson is easily one of the best working authors in the genre. 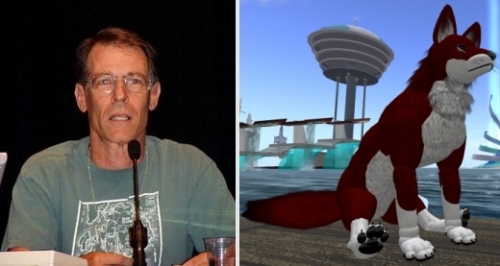 In Second Life, he's "Stan Shackleton", a coyote with a vibrant white coat; this coming Saturday at Noon SLT/PDT, he'll be an in-world guest at the literary forum of Extropia, SL's most prominent futurist/transhumanist community. Why a coyote? "When we asked Stan what he wanted his avatar to look like," Extropia's Sophrosyne Stenvaag tells me, "he suggested something interesting and non-human, like a rock or a tree. In brainstorming about it, Argent Bury came up with the idea of a coyote, to commemorate the use of the Native American legend in Robinson's Mars trilogy." They located one at an SL store* which came with a heads-up display easy enough for an SL beginner to use. Extropia has played host to other great SF writers, including David Brin and Charles Stross; in this, Ms. Stevaag credits Boc Cryotank, an Extropia citizen who happens to be Stephen Euin Cobb, creator of the long-running podcast, "The Future and You". "Boc's been absolutely invaluable in promoting Extropia on his show, and encouraging his guests to come to Extropia to do a Salon appearance," says Sophrosyne. Of course, the next arduous steps involve actually getting them in-world. How did they manage that? "We start as early as possible with a detailed email explaining what we will do for them, and what we need them to do: download the SL client and give us some ideas on their choice of name and appearance," she explains. "From there, we create a custom avatar and a fashion look. We meet with them at least a week in advance of the world to give them a tour of Extropia, which also serves as an orientation to the SL interface. We try to give them a sense of the differences between a digital and atomic-world author event-- the backchat, the amout of conversation, the barrage of questions, the exotic appearance of the audience!" The results can vary, especially since the Extropians, being Immersionist, conduct the entire session in text chat. When David Brin appeared, a guest reports, the author complained about the barrage of chat he was expected to read and respond to: “How on Earth could anybody call this 'discourse' subtle or detailed or serious?” The Charles Stross appearance transcript, however, is smart and literate and well worth a read. For that matter, I was lucky enough to talk about my book at Extropia, and it was one of my favorite appearances. In any case, here's all the details for attending the Kim Stanley Robinson appearance. Image credits: top, eventsinextropia.wordpress.com; bottom, www.ideonexus.com. *Update, 4:30pm: Soprhosyne adds that the coyote came from The WereHouse Avatars store. I think events like these are an area where Second Life largely delivers, it's a shame about the agent limits. I was at the Terry Pratchett discussion in the Autumn and it was a wonderful experience. A couple of things obviously spring to mind however, names, which these guests should be able to use their real (or pen) names and how to offer them marketing advantages for their products. I've always thought that selling books or music within Second Life from an Amazon style shop front should be viable here. You should talk to Crap Mariner. He has built an area where you can link to ITunes and Amazon music from inworld to buy CD's of SL musicians. Uncertain of timezone, use the Google Calender of Extropian Events, that will help you get there on time. I searched for Kim Stanley Robinson in the Public Calendars. But you can click the "+ google calendar" button in the above link if you want.